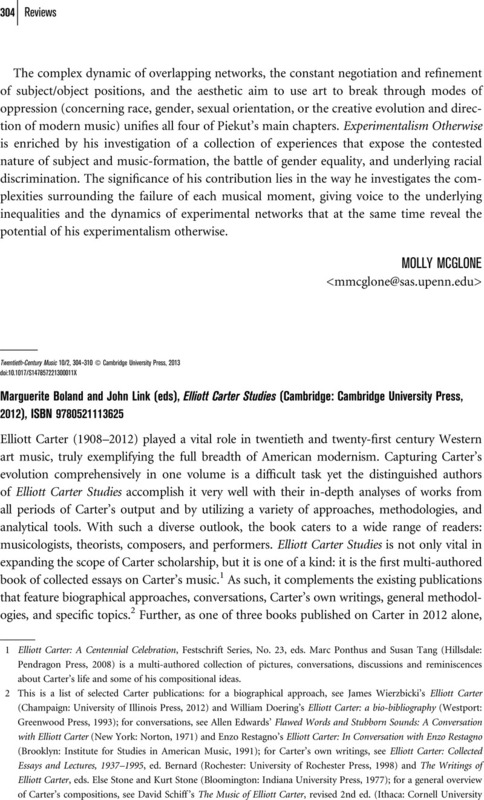 1 Elliott Carter: A Centennial Celebration, Festschrift Series, No. 23, eds. Ponthus, Marc and Tang, Susan (Hillsdale: Pendragon Press, 2008) is a multi-authored collection of pictures, conversations, discussions and reminiscences about Carter's life and some of his compositional ideas. 2 This is a list of selected Carter publications: for a biographical approach, see Wierzbicki, James's Elliott Carter (Champaign: University of Illinois Press, 2012) and Doering, William's Elliott Carter: a bio-bibliography (Westport: Greenwood Press, 1993); for conversations, see Edwards, Allen' Flawed Words and Stubborn Sounds: A Conversation with Elliott Carter (New York: Norton, 1971) and Restagno, Enzo's Elliott Carter: In Conversation with Enzo Restagno (Brooklyn: Institute for Studies in American Music, 1991); for Carter's own writings, see Elliott Carter: Collected Essays and Lectures, 1937–1995, ed. Bernard, (Rochester: University of Rochester Press, 1998) and The Writings of Elliott Carter, eds. Stone, Else and Stone, Kurt (Bloomington: Indiana University Press, 1977); for a general overview of Carter's compositions, see Schiff, David's The Music of Elliott Carter, revised 2nd ed. (Ithaca: Cornell University Press, 1998); for books addressing specific topics, see Meyer, Felix and Shreffler, Anne C.'s Elliott Carter: A Centennial Portrait in Letters and Documents (Suffolk: The Boydell Press, 2008), Rosen, Charles's The Musical languages of Elliott Carter (Washington, D.C.: The Library of Congress, 1984), Jackson, Richard's Elliott Carter: Sketches and Scores in Manuscript (New York: The New York Public Library, 1973), and Capuzzo, Guy's Elliott Carter's What Next? (Rochester: University of Rochester Press, 2012). 3 Wierzbicki, Elliott Carter; Capuzzo, Elliott Carter's What Next? 4 Schiff gives a general overview of the thematic, harmonic and formal organizations in the quartet in The Music of Elliott Carter. Bernard focuses on specific techniques Carter used in the quartets in his essay “The String Quartets of Elliott Carter,” in The Twentieth-Century String Quartet, Vol. 2, ed. Evan Jones ( Rochester: University of Rochester Press, 2009): 238–275. 5 See Link, “Long-range Polyrhythms in Elliott Carter's Recent Music.” Ph.D. diss., University of New York, 1994. 6 See Jenkins, Daniel, “After the Harvest: Carter's Fifth String Quartet and the Late Late Style.” Music Theory Online, Vol. 16, No. 3, August 2010. 7 See Emmery, Laura, “Rhythmic Process in Elliott Carter's Fourth String Quartet,” Mitteilungen der Paul Sacher Stiftung, No. 26, 2013. 8 See Meyer and Shreffler, 84–85. Meyer briefly situates the Sonatina and comments on the structure of the first movement. 9 See Ravenscroft, 's “The Anatomy of a Song” in Ex Tempore 9/1 (1998): 84–102; “Finding the Time for Words: Elliott Carter's Solutions to Challenges of Text-Setting” in Indiana Theory Review 22/1 (2001): 83–102; “Setting the Pace: The Role of Speeds in Elliott Carter's A Mirror on Which to Dwell” in Music Analysis 22 (2003): 253–82.